Goncalo Amaral, the detective who took the McCanns in for questioning, was convicted of filing a false report by a Portuguese court, back in 2009. He was given an 18-month suspended jail sentence. Recently that sentence was confirmed on appeal. The Madeleine Foundation has steadfastly maintained that these have been 'political' verdicts, resulting from Goncalo Amaral's determination to charge the McCanns over the disappearance of their daughter Madeleine. Goncalo Amaral was convicted largely on the testimony of Leonor Cipriano, a wicked woman so evil she can justly be compared to Jezebel of the Old Testament or Lucrezia Borgia of the Vatican. In an incestuous sexual relationship with her own brother, she and him murdered her 8-year-old daughter Joana when she saw them together. Cipriano later claimed she had been abducted whilst on an errand to the local shop. She and her brother were justly convicted of first degree murder and are now serving jail sentences of 16 years and 16 years 8 months respectively, sentences that many would consider far too lenient. The McCann Team publicity machine has regularly represented Leonor Cipriano as a sweet innocent woman beaten into making a false confession by Goncalo Amaral and his detectives. At this time, therefore (exactly a year after we first published the full article), we are reproducing here Chapters 15 and 16 of our article on Madeira-based lawyer Marcos Aragao Correia, the man who was suddenly and inexplicably brought in, in April 2008, to represent Leonor Cipriano in her appeal against conviction and her claims of torture against Amaral and his men. For those reading about Leonor Copriano and Marcos Aragao Correia for the first time, we'd refer you to our full article on Marcos Correia on our website: www.madeleinefoundation.org.uk - click on 'Articles'. 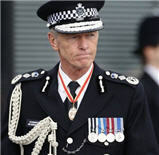 * The McCanns enthusiastically backed him as he prosecuted Goncalo Amaral for filing a false report. 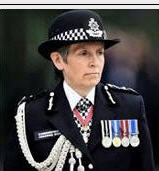 (2) During the investigation into her allegation, she said that she had been assaulted ‘more than once’, but now, during the trial, she stated it that it happened only once. (6) She then changed her mind once again to say she was beaten by the PJ – claiming she cannot identify them because a bag was placed over her head during the beating. The weakness of the prosecution case was clear from early on in the trial of Gonçalo Amaral and his colleagues. The Consultant Prison Doctor who was giving medical evidence to support the alleged torture of Leonor Cipriano contradicted herself on one important detail. A report written on the 18 October 2004 mentioned no lesions to the knees of Joana’s mother, who didn’t complain about any either. Yet on 29 October, she requested an X-ray to be performed on these lesions. According to the doctor, when she observed Leonor Cipriano on 18 October 2004, she presented lesions on several parts of her body. She had ‘red swollen eyes’, ‘the left eye shut’, and ‘minor cuts on both knees, superficial but symmetrical’. She also presented lesions to her back, to her chest and on her arms. But on 18 October the doctor reported no ‘lesions’ on her knees. Evidence was then heard by the court that the Prison Governor of Odemira Prison, where Ms Cipriano was being held, had ordered the Chief Prison Officer to materially alter a report about Leonor Cipriano’s health. Yet, said Mr Carlos Anjos, speaking on behalf of Gonçalo Amaral - it was a ‘stupefying fact’ that [instead of the Prison Governor being on trial] the person on trial for allegedly falsifying a document was António Cardoso, one of the four detectives. There was a reference to Ms Cipriano having suffered injuries before she arrived at the prison. A former prison guard of Odemira Prison, Ana Paula Teixeira, was heard during the trial on a video-conference link. She claimed that Leonor Cipriano had arrived at the prison with injuries. Leonor Cipriano, she explained, had suffered her injuries while she fell down some stairs at the police station where she was interrogated. Her evidence co-incided with that of social worker Adélia Palma. Ms Palma explained during a later court session during the trial that Leonor Cipriano had told her that she had been assaulted during the questioning she was subject to at the Polícia Judiciária and that the detectives had ‘ordered’ her to say that she fell. But what is the value of any evidence coming from the lips of Leonor Cipriano? However, whatever these injuries might have been, the clear evidence heard by the court was that Leonor Cipriano suffered her main set of injuries between 14 and 18 October whilst she was already in prison. One of Leonor Cipriaon’s many lies in court was her denial that she was visited in prison by her lawyer, Mr Aragão Correia, on 30 October, during the trial. Gonçalo Amaral’s lawyer, António Cabrita, had asked for Leonor Cipriano to be heard again, as he wanted to clarify what he referred to as ‘a lie’ about this visit - either by her, or by her lawyer. Cabrita referred to an article that was published in a national newspaper, where Mr Aragão Correia admitted to having visited Ms Cipriano in prison on the night of the 30 October, after she had been giving evidence on Day One of the trial. He had told the press that it was necessary to visit her to ‘calm her down’ as she had been ‘very nervous’ following questions earlier that day from the Polícia Judiciária’s lawyers. Yet before that newspaper article appeared, during the second day’s session, when António Cabrita had asked Leonor Cipriano if she had received any visits at the prison, she replied that she had not. “So someone is lying”, said Cabrita, merely stating the obvious. A further contradiction between Leonor Cipriano’s evidence and that of others occurred when the photographer who took the photographs of Ms Cipriano’s injuries in the prison reported that he was called immediately after the injuries were sustained and that he took the pictures ‘during the afternoon and with daylight’. But Ms Cipriano had claimed that the photographs had been taken ‘at night, in a room without light’. There was further consternation when another official admitted that the prison had destroyed the photographs taken of Leonor Cipriano’s knees because ‘the alleged injuries to her knees were not very visible’. Given these examples of lies, contradictions and attempts to falsify documents and cover up certain matters, it was scarcely surprising that some of the four jurors asked a lot of questions of the witnesses during the trial. One interesting statement made by Mr Aragão Correia to the court was that British Police officers had been ‘investigating’ Gonçalo Amaral. But with Aragão Correia’s history of outright lies, fabrications and changes of story, this might well have been yet another fabrication by him. He did not of course give details of their names, ranks, collar numbers or their places of employment. It would be a truly sensational revelation if it could ever be proved that any part of the British security services had actually been used to investigate Gonçalo Amaral with a view to trying to get any ‘dirt’ on him. It was speculated in some quarters that it was just possible that the case against Gonçalo Amaral and his fellow detectives had been brought by Portugal’s equivalent of the Crown Prosecution Service in order to clear Amaral and to prove him innocent. It was thought that the country’s chief prosecutor had a good relationship with the Portuguese Police and perhaps had allowed the case to be brought, perhaps anticipating that Leonor Cipriano’s allegations would be exposed as bogus. But the eventual outcome of the case - Gonçalo Amaral’s conviction for allegedly ‘filing a false report’ (which we shall come to in a moment) - suggests more that this was a political trial wholly intended by the relevant authorities to destroy Gonçalo Amaral’s reputation. The British press’s response to the trial of Gonçalo Amaral was of no little interest. The facts about Marcos Aragão Correia’s direct links with Método 3 - and thereby to the McCanns - were at least partially uncovered during the hearing, but the British press were silent about it. On the contrary, the alleged misconduct of Gonçalo Amaral was mentioned, alongside endless pictures of Leonor Cipriano with black eyes, clearly linking Mr Amaral to them as the alleged perpetrator or author of the beating she had evidently suffered. So much so, in fact, that many people I have spoken to in England seriously believe that it was Amaral himself who was the one who personally beat up Ms Cipriano. Such is the power of sustained disinformation circulated by the once-respected mass media of Britain. (6) The dirty and possibly illegal proposed deal to give the four detectives light sentences in order to ‘get’ Gonçalo Amaral. 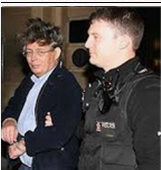 A French journalist who has closely covered the Madeleine McCann case, Duarte Levy, appeared on TV in October 2008 and claimed to have interviewed an ex-convict who was serving a sentence in the same prison as Leonor Cipriano at the time of the events. When asked if she knew who had beaten Leonor Cipriano in prison, the female ex-convict is said to have replied to Mr Levy: “Of course I know. I was one of them”. That account seems far more credible than what Leonor Cipriano asks us to believe, namely that four police detectives, none of whose identities she can recall, beat her up. The trial of Mr Amaral suited the agenda of the McCann Team and their chief public relations adviser, Clarence Mitchell. 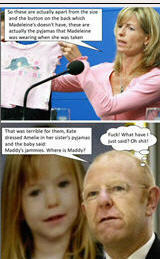 Right from the early days of the hunt for Madeleine, the McCanns and their advisers had criticised the Portuguese police, first for mounting what they said was an ineffective search for Madeline, and later for wrongly and cruelly accusing them of having been involved in Madeleine’s disappearance. At every opportunity, Clarence Mitchell, the man who had been at the head of the government’s mission to influence the output of the mass media, attacked the Portuguese police in general and Gonçalo Amaral in particular. He had been Head of the ‘Media Monitoring Unit’ at the Central Office of Information on the day Madeleine had been reported ‘missing’. He later boasted that in that capacity he directed a 40-strong team whose job it was ‘to control what comes out in the media’. 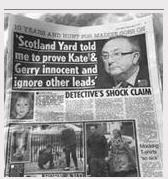 It was perfect for the McCann Team for Mr Amaral to be repeatedly referred to in the British press as a ‘disgraced cop’. Every time bad news about the Portuguese Police’s investigation surfaced, the McCanns and their public relations team would be quick to seize on ‘corruption’, ‘beatings’ etc. that were supposedly ‘rife’ in the Portuguese judicial system. It would surely invalidate Mr Amaral’s conclusions in his book if the person who had disgracefully smeared them by making them suspects was a man who could be shown to have a track record of corruption and brutality. That would in turn confirm that the McCanns and their ‘Tapas 9’ friends were absolutely correct not to co-operate with Mr Amaral and his team. It would provide justification for the McCanns hot-footing it out of Portugal - despite promising to stay there ‘until Madeleine was found’ – as soon as they were made ‘arguidos’. It would also be a good excuse for refusing to go back for a reconstruction of events on 3 May 2007, as the Portuguese Police requested of the McCanns and their Tapas 9 friends in early 2008. As one person on one of the many Madeleine McCann forums pointed out: “Odd, isn't it? ‘McCann friends get out-of-court payout from newspaper’ is front-page news in several national papers, while ‘McCann private detectives accused of paying lawyer to frame Maddie cop’ doesn't get a mention. Clearly I have no nose for what makes a powerful front-page story”. “Was Dr Gonçalo Amaral in charge?”; “Was Dr Gonçalo Amaral present?”; “Did Dr Gonçalo Amaral hit you?”. Gonçalo Amaral, Gonçalo Amaral, Gonçalo Amaral - this seems to be the obsession of Leonor Cipriano’s defence lawyer during the trial in which Joana’s mother makes claims agaisnt five Judiciária inspectors. Three policemen stand accused of torture: Pereira Cristóvão, Leonel Marques and Paulo Marques Bom. But Leonor’s lawyer, Marcos Aragão Correia, has pointed his guns at Gonçalo Amaral, who in this process stands accused of false testimony and ‘omission of denunciation’ [failing to file a report on an incident]. “This doesn’t look like a trial in the Joana case but rather one in the Maddie case”, says a source that is connected to the defence of the former co-rdinator of the PJ in Portimão, who headed the investigations into the disappearance of both children and became a sort of ‘public enemy No. 1’ for the McCann couple. “A possible condemnation of Gonçalo Amaral in this process may make it easier for the English to prosecute the Portuguese state”, the source says. ”When confronted by 24Horas with suspicions about his connection to the Maddie case, Marcos Aragão confirmed that he was already paid by persons that are connected to the McCanns. “They haven’t paid me honoraries but rather expenses due to transportation, lodging and food, in order to interview João Cipriano [Leonor Cipriano’s brother] in prison”, the lawyer explained, adding that the purpose of the conversation with Mr Cipriano was ‘to analyse the procedures of Amaral as a PJ investigator’. “Following the investigation - which originated from a report from the Association Against Exclusion through Development (ACED), founded by Aragão Correia himself (!) - Aragão Correia says that he accepted to represent Leonor Cipriano without charging one cent. ‘I accepted this case for humanitarian reasons only. I am not receiving any honoraries’, the lawyer asserted, claiming that the ‘attacks’ against Gonçalo Amaral are linked to Leonor Cipriano’s strategy in this case: ‘It’s not an obsession. I can’t insist on the other arguidos because she has not identified them’. “Yesterday’s session at the Court in Faro was marked by a new contradiction from the plaintiff. On Monday, Leonor Cipriano had guaranteed that Gonçalo Amaral did not watch the questioning during which she allegedly suffered abuse in order to make her confess to her daughter’s death. Yesterday, Joana’s mother corrected her version: “Gonçalo Amaral beat me”. When questioned by the judge, she said she had recovered her memory after watching a report on television”.